Trejyn Fletcher of Portland, who attends a boarding school in New York, at age 17 is one of the elite baseball prospects in the country. Though he’s still two years away from high school graduation, Trejyn Fletcher already has experienced big league-like moments in his amateur baseball career. At 13, Fletcher hit a 401-foot home run into the upper deck of Marlins Park in Miami. He’s played at Fenway Park and Yankee Stadium. He jets across the country as a coveted player invited to take part in the best youth tournaments. But being invited to meet baseball super agent Scott Boras at his office in Newport Beach, California, when you’re 16? That’s big league with big-dollar connotations. “I really didn’t know who he was at first, and then doing some research it was a really big deal,” said Fletcher, a former Cheverus High player who turned 17 in April. “We were told the last time Boras met personally with a kid his age was Bryce Harper,” said Erin Brady, Fletcher’s foster father. 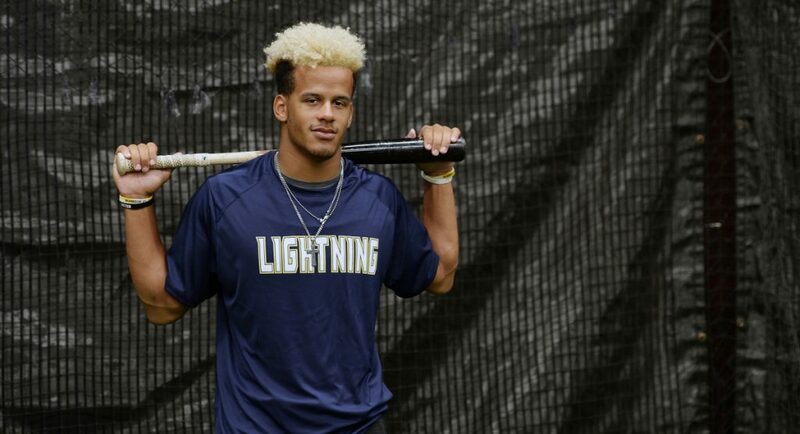 The 2020 major league draft is still two years away, but indications are that Fletcher, a 6-foot-2, 205-pound power-hitting outfielder with speed, and an occasional pitcher with a 93 mph fastball, is on the path to being a first-round pick. Fletcher, who goes to Trinity-Pawling School, a private boarding school in Pawling, New York, has been ranked No. 2 nationally in the Class of 2020 by Perfect Game, a respected national scouting service that runs showcase tournaments. Fletcher verbally committed to accept a baseball scholarship from Vanderbilt last summer. “I’m very familiar with Tre,” said Greg Sabers, Perfect Game’s vice president of scouting and showcases. “He does have all five (tools), which is a benefit, but in baseball, it comes down to if you can hit, and he definitely has shown he can hit – and hit for power. In the past five drafts, 40 of Perfect Game’s 50 top-10 players were chosen in the first round, including 24 of the 25 top-five players. Only three players who called Maine home have been drafted in the first round: Bill Swift (South Portland High/University of Maine), No. 2 overall in 1984; Mark Rogers (Mt. Ararat High), No. 5 overall in 2004; and Ryan Flaherty (Deering High/Vanderbilt), taken 41st as a supplemental first-rounder in 2008. Fletcher, the son of Melissa Fletcher and Taurus Walls, moved to Maine from Delaware with his family at the end of his fifth-grade year. He attended Lyman Moore Middle School before going to Cheverus for his freshman year. He repeated his freshman year at Trinity-Pawling, where he also plays football and basketball, like he did at Cheverus. It was in his preteen years when Fletcher began honing his baseball skills with the Maine Lightning and going to The Edge Academy facility, where the Lightning teams train. When he’s in Maine, Fletcher often works out at The Edge and keeps in close contact with Lightning coaches. Bill O’Brien, the general manager of The Edge Academy, has worked with Fletcher and witnessed his growth. O’Brien played on the University of Southern Maine’s NCAA Division III baseball championship team in 1997. He’s been teaching baseball in Maine ever since, and in that time has witnessed and worked with local products who have made it to the majors, including Flaherty, Rogers, and pitchers Charlie Furbush and Ryan Reid. “All of them stood out at that age but none of them had that constant trajectory,” O’Brien said. Fletcher wants to continue to go up. His summer job is to play baseball in elite tournaments across the country for a variety of teams. Fletcher was in Portland for a brief stay after playing in a USA Baseball national team championship tournament in Florida. On Thursday he flew to Atlanta, where he’ll join 12 other NCAA Division I baseball prospects playing for the Blackhawks Nationals at a six-day, wooden-bat tournament dubbed the 17U/Class of 2019 national championship at the Perfect Game facility outside Atlanta. He’ll stay in Georgia for the 16U/Class of 2020 tournament from July 6-13, playing for Georgia-based Team Elite Prime, another squad stocked with future Division I players. After that, the original plan was to be in Arizona for a tournament. Now it appears likely he’ll be invited to a USA Baseball 17U development camp in Chicago, which includes games at Wrigley Field (July 25) and Miller Park in Milwaukee (July 26). USA Baseball invitees will be announced July 3. From Aug. 6-10, Fletcher will play in the Area Code Games in Long Beach, California, a tournament affiliated with Major League Baseball that puts 220-plus players on eight teams coached by major league scouts. If possible, Fletcher hopes to squeeze in an appearance or two with a Maine Lightning squad before returning to Trinity-Pawling in early September for the start of football practice. Not surprisingly, he’s also pretty good at that sport. Fletcher said the University of Oregon and Florida State both recruited him as a two-sport athlete. The meeting with Boras happened last summer, when Fletcher was in California for an Area Codes Underclassmen game. Fletcher doesn’t have an agent, but it’s common for top young players to seek legal representation and get advice on the best path – and potential pitfalls and missteps – leading to the draft. When Fletcher or Brady need to ask a question, they contact Boras Corporation staffer Brett Knief, and Brady is billed for Knief’s legal services. “I want him to go to college so I want to make sure of every technicality,” Brady said. If Fletcher is indeed a high draft pick in 2020, the economic reality could make going to college a difficult decision. This year’s No. 1 overall pick, Auburn pitcher Casey Mize, received a $7.5 million signing bonus from the Detroit Tigers. The Boston Red Sox picked 26th in the first round. Their choice, high school infielder Triston Casas, received a $2.52 million signing bonus. Boston’s second-round pick (64th overall), high school outfielder Nick Decker, got a $1.25 million bonus. Ultimately the goal for Fletcher, a New York Yankees fan, is to play in the majors. Last summer in the ninth annual Rivalry Classic, a two-game set played at Fenway Park and Yankee Stadium, he hit batting practice homers in both parks. CORRECTION: This story was updated at 6:15 p.m. on July 2, 2018, to correct the name of Melissa Fletcher and to correct the spelling of Brett Knief.